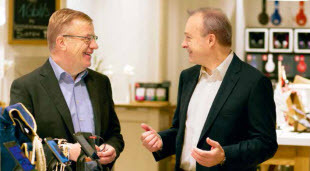 Our mission is to simplify the lives of our customers in the digital world. Swisscom is constructing the biggest, state-of-the-art cloud in Switzerland and has the potential to join the ranks of the world’s 20 biggest cloud providers. Storage capacity, processing power, software and services are all relocating to the cloud. As a result, information tech- nology is losing its physical presence and will soon become something that we can no longer see. All the same, IT will still exist in everything we do and everywhere we go. Swisscom is one of Europe's five most sustainable telecoms companies. Its business strategy is designed for long-term sustainability. An example is the new Swisscom data centre in Berne Wankdorf. This new building, which runs on renewable energy, is a trendsetter in terms of energy efficiency, technology, waste-heat recovery and operational security. It’s a weekend with blue skies – mountaineers and winter sports enthusiasts are following the call of the mountains. And if they get into difficulties, Air Zermatt’s rescuers in red will respond to their calls for help. Saving, synchronising and sharing data in real time. Companies want to be able to access their concen- trated knowledge at all times. Invoices, receipts, salary statements, contracts and tax records are just some of the many documents that are stored physically and electronically in today’s various filing systems. Maintaining order and a clear overview can take up a great deal of time and also cause a whole lot of bother. Swisscom has recognised this and is helping to establish a degree of order – thanks to Docsafe. For private users, the Internet is becoming increasingly local. 80% of a user‘s daily needs and activities involve local people and services: family, friends, work, banking services, grocery shopping, doctors, sports clubs – the entire local ecosystem. 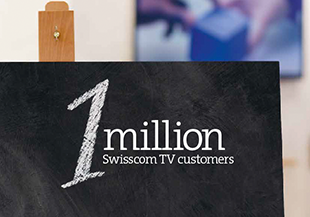 There are around 3.5 million households in Switzerland, of which one million use Swisscom TV – 25% more than last year. This equates to a market share of around one third.